If you’re debating the merits of traveling to Berlin or Paris then Alsace is the best compromise! This land mass straddles Germany and France and understandably so (in 2011 former French President Nicolas Sarkozy misidentified himself as being in Germany when he was actually in an Alsatian town….whoops!) since, within a 175 year period in the 19th and 20th centuries, Germany and France exchanged ownership four times. To end all discussion: Alsace is a part of France. Alsace is the smallest wine region in France and was only officially recognized as such in 1962. To set the scene: we are 300 miles east of Paris and the Vosges mountains are in front of you. Nearby are two rivers, the Rhine and the Ill. Whip out those sunglasses because the air is gloriously sunny, which is why Alsatian wines have such vivid acidity and freshness. Every village is filled with buildings that bring a mixture of Grimm’s Fairytales and Belle’s village in Beauty and the Beast to mind. If you want an aromatic white look no further ‘cause this region is loaded with them. From sonnet-inspiring dry Riesling to Pinot Gris to Gewürztraminer, Alsace packs a wonder for your palate. Some of the most popular grape varieties grown are Riesling, Gewürztraminer, and Muscat but let’s shine a limelight on the others. Pinot Gris is the 3rd most popular grape grown in Alsace and tastes like no other Pinot Gris/Pinot Grigio grown anywhere else; they have notes of fresh biscuits, smoke, and apricot. The other Pinot of note is the only red grown in Alsace, Pinot Noir. They are generally richer and earthier than Pinot Noir from other regions and are usually aged in new barrels. 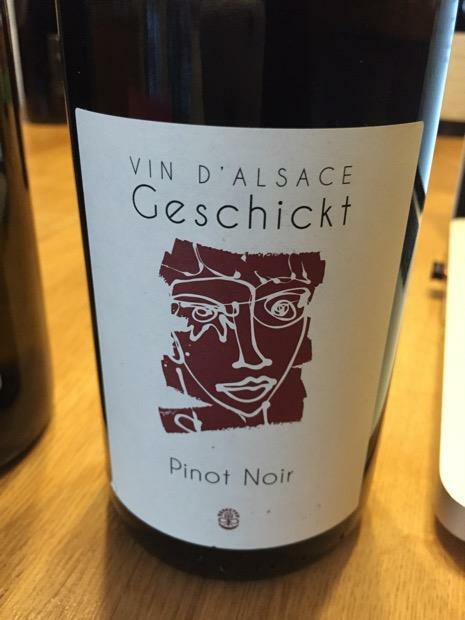 Since the 1990’s Alsatian winemakers have become very determined to produce Pinot Noir that represents the unique landscape. About 20% of all Alsatian wine is sparkling: over 30 million bottles of Crémant d’Alsace are produced per year. These sparkling wines (made in the same method as Champagne but in Alsace) are made with a blend of grapes that can include Pinot Blanc, Auxerrois, Riesling and more. To achieve that piercing acidity that is associated with Crémant d’Alsace,the grapes are harvested earlier than for still wines. In a wine line-up of French wines, Alsatian bottles are the odd duck of the lot! Tall and thin with giraffe-like necks, this bottle style is simply referred to as ‘Alsatian bottles.’ Every type of still wine in Alsace is bottled in these. Another unique bottle feature is that most wines are labeled by grape varietal. When digging into Alsatian wine you’ll see a cool term on bottles, Edelzwicker, which means that the white wine is a blend that has to contain at least one of the following grapes: Riesling, Pinot Gris, Muscat and Gewürztraminer. See you Friday when it’s All About Alsace! Fun Fact: The white stork flying on this wine label is a nod to the National Bird of Alsace. Here, Alsatians revere white storks and brought back this bird back from near extinction levels in France. How: Vincent’s total production is approximately 4000 cases annually. Vincent uses only compost and biological insecticide in his fields and farms with the utmost respect to nature. Fun Fact: Nearly half of the Alsatian population speaks a German dialect called Alsatian; its commonplace to see city signs listed in French and the Alsatian language! In 1945, France forbade the teachings of all Germanic languages in schools, but since the 1970’s interest in Alsatian have had a revival. Fun Fact: Some winemakers are vying to have the bottling law in Alsace changed since some winemakers find it an odd experience to drink a red from the classic long-necked Alsatian bottles. Fun Fact: If you want to hear the Alsatian language closer to home go to Adams County in Indiana, USA! In 19thcentury a rush of people immigrated to Indiana from Alsace and brought this unique dialect with them.